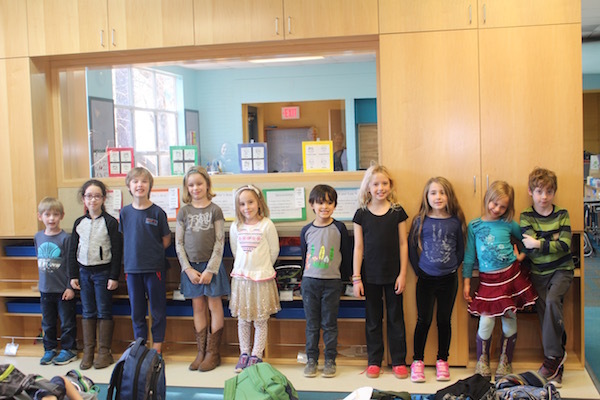 We recently celebrated our November through February birthdays. Many thanks to our parent volunteers for making this such a special time. Our 100th day of school was so much fun. We shared our collections of 100 and took time in language groups to guess what was in our boxes. Activities included making necklaces, bookmarks, and cool glasses. We also walked a 100 steps, read 100 words, and wrote a 100-word story together. River students visited Sky Class to view their collections and vice versa. Center time is always a fun time for the students of River Class. Children get to pick their favorites from a variety of activities. These include iPads, basketball, drawing, sidewalk chalk, jump roping, reading, origami, the maker center, board games, and building. Ask your child about his/her favorite. Author Visits Lower School Today! Published author Sarah Mlynowski visited a very excited Lower School today. 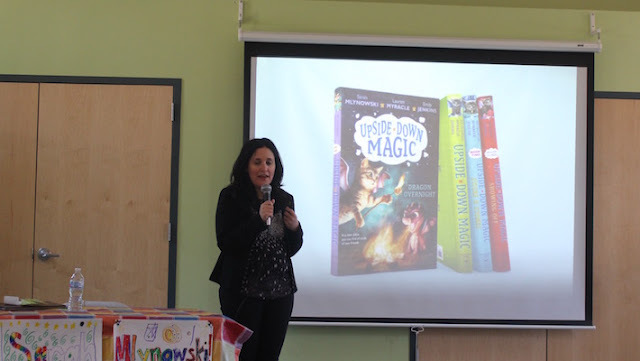 Sarah has written numerous books, including co-authoring the Upside Down Magic series (as pictured above). It was interesting to learn more about Sarah's writing process and how she was inspired by another author, Gordon Korman. Sarah introduced the different characters in her book and the magical powers they get to have when they turn ten years old. Are they Flyers, Flickers, Fuzzies, Flares, or Fluxers? Sarah asks our Lower Schoolers if they would like to be authors. I think you can guess that many hands enthusiastically shot into the air.